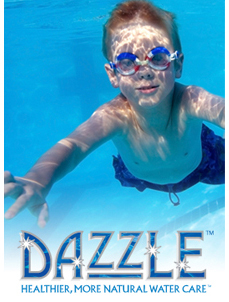 Your pool experience will be enhanced by being able to enjoy clear, clean, sparkling water. Our water care products are uniquely designed to be simple and easy to use and will help you achieve a simple and luxurious swim season. To help you in maintaining water clarity or troubleshooting a problem, we encourage you to bring in a sample of your water on a monthly basis. Our Water Care Specialists will complete a FREE custom computer analysis and create an easy-to-follow water treatment guide to help you in your journey. We also stock a variety of test kits and accessories to help you with daily tests and regular maintenance. Follow the Blog on this website or our Facebook page for weekly water care tips. You can also check out the FAQ page for solutions to common issues. What turns our crank every day is making products and water care systems that not only work to make water dazzling, but that also create healthier water. Healthier water? We know that sounds odd. When people think of water care products, they usually think of chemical soup! But, think of us as the anti-soup company. Basically it boils down to this: We’ve found ways to make your pool water look better, feel and smell better by taking stuff out of the water, instead of putting more and more stuff in. It’s a healthier, more natural (and if we do say so ourselves!) innovative approach to water care. All right, we’ll admit it. Sometimes we steal our new product ideas from Mother Nature. We’re huge believers in an emerging discipline called biomimicry. Biomimicry studies nature’s best ideas and then imitates those designs and processes to solve human problems. The science of Biomimicry has had a huge influence on the way we design our products and how we approach pool care. We are BIG advocates of greener chemistries, but we are also well grounded in the practicalities of successfully managing water care for pools. If we can replace a traditional synthetic chemistry with a greener one that performs better, that’s what we do! But, sometimes we’re required by law to use synthetic chemistries like chlorine or bromine, or a synthetic chemistry is simply more effective …well then, that is what we will use until a better, greener chemistry comes along.